After a week of Latin festivities…back to our regular programming! Specifically…my coverage of San Diego! 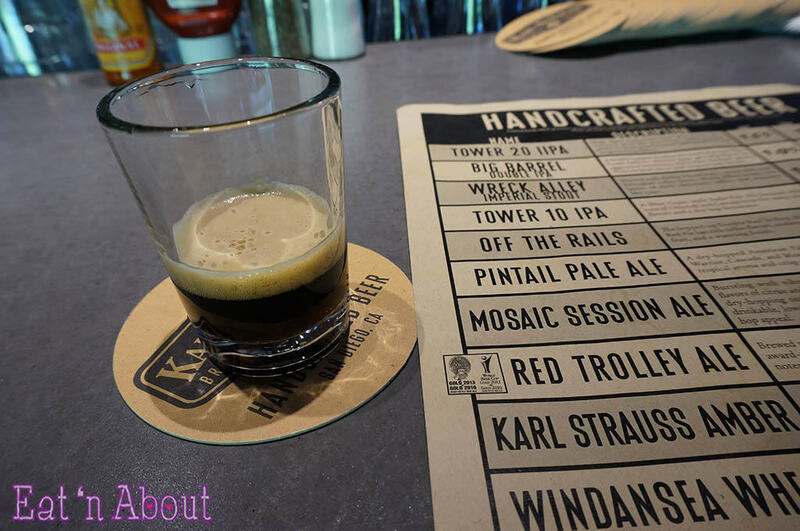 San Diego is full of local craft breweries, and on the third night, I was taken to one of these – the Karl Strauss Brewery in Sorrento Valley. 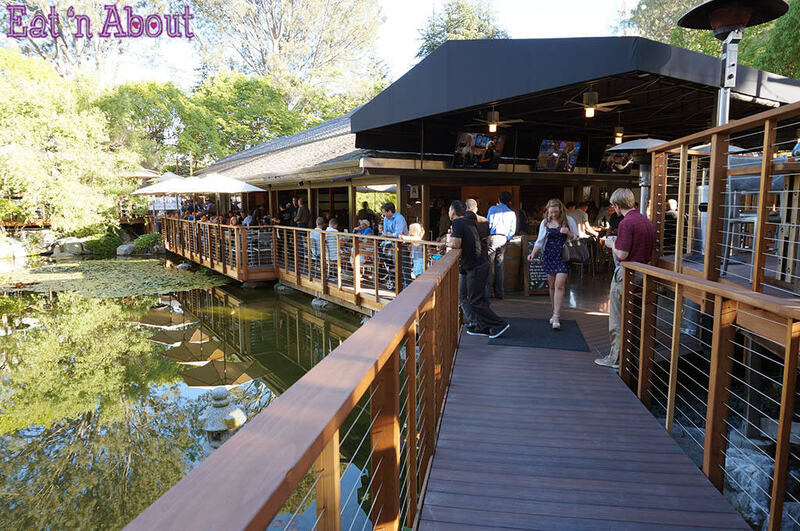 Karl Strauss Brewery actually has a few different locations. 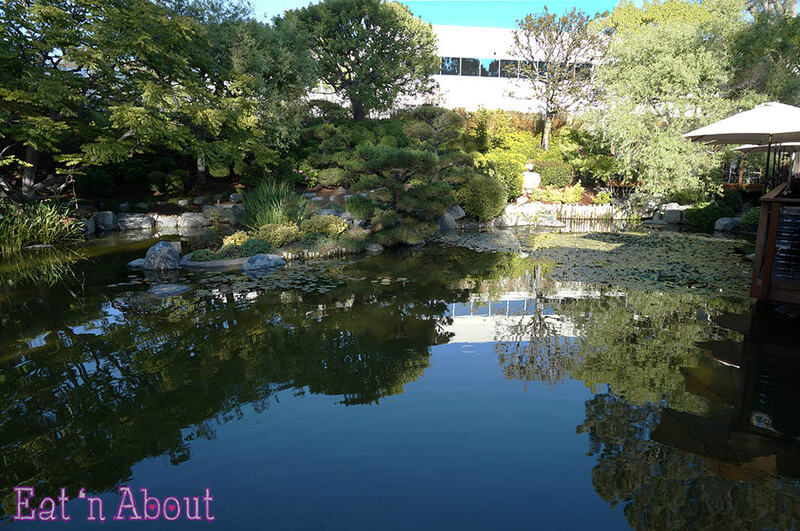 This particular one in Sorrento Valley (also called Sorrento Mesa) is dubbed “& Gardens” because of the lovely Japanese Garden it’s situated on. The restaurant must be very popular or San Diegans really love their beer ’cause it’s a Wednesday night and this place was really happenin’! Gorgeous right? There’s koi fish swimming in there too! Overall it’s just got a very serene vibe to it even though the restaurant is actually very busy. They have a massive page of beers for you to pick from. We arrived during Happy Hour, so we took advantage of their $4 beer flight. Don’t worry if you can’t make a choice. Just ask and they’ll give you a sampler of any of their beers. This particular one I sampled was the Wreck Alley Imperial Stout. It, being a stout, was obviously too strong for my tastes (I’m partial to lighter, fruitier beers), so good thing I was able to sample it before committing! Their bartenders are super knowledgeable of their own beers and gave lots of good recommendations. When I commented that Wreck Alley was too strong and hoppy for me, Krystle then proceeded to let me know that I probably wouldn’t like their Mosaic Session Ale either (which I had originally wanted to order), then she gave me tons of suggestions on what I might like. From right to left, starting from lightest to boldest, was Endless Summer Light, Windansea Wheat, Red Trolley Ale, and Full Sott Belgium Brown. My favorite was the Windansea Wheat, as it has notes of banana and clove, which made for a really really interesting taste. It’s definitely not something I’ve tried anywhere else before. I’m a sucker for soft pretzels, so when I saw that the Beer Pretzels were on the Happy Hour menu for $5, I jumped on it! These are from the local SD Pretzel Company. 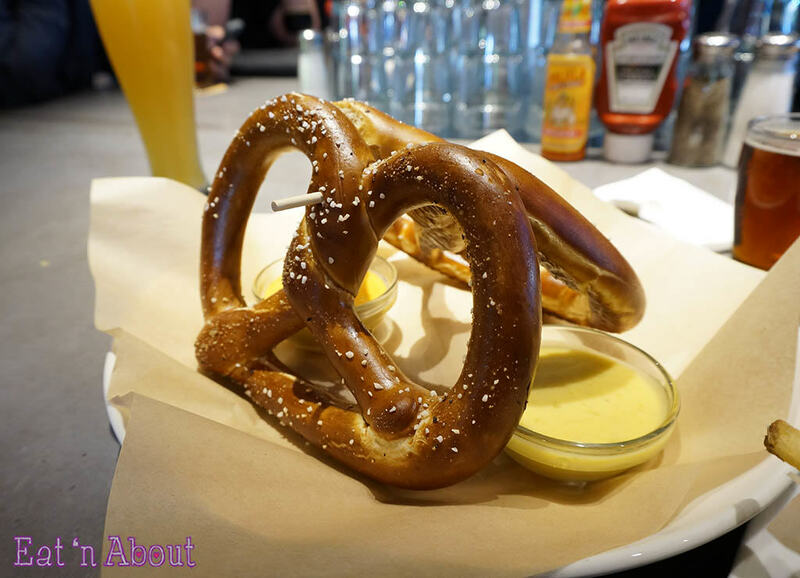 Beer spritzed and spice-rubbed, it came with a mango mustard dip and a beer cheese dip. They weren’t as soft as I would’ve liked, and the mango mustard tasted like honey mustard. The beer cheese dip tasted more like cheese than beer. All in all not great, but for $5 it was not bad. 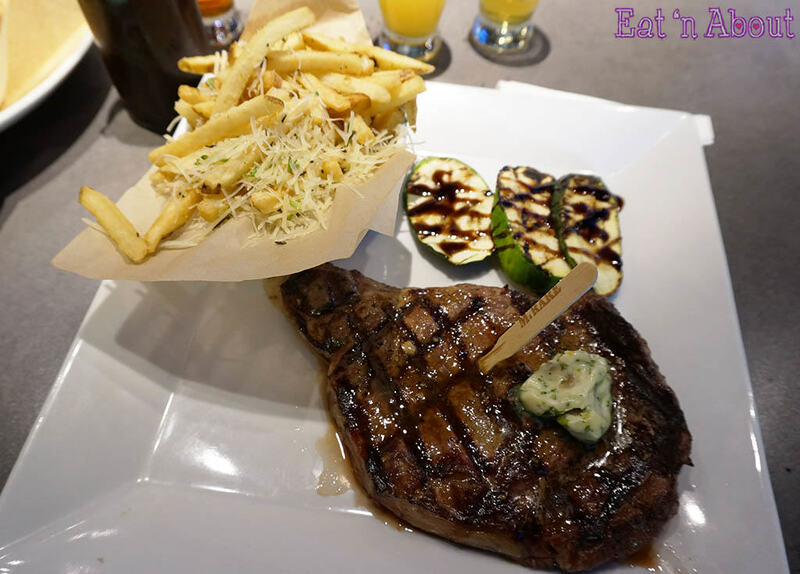 I was actually quite full at this point but I had already ordered the Ribeye Steak Frite ($24.95USD) due to a recommendation from a coworker back home. The steak came with very yummy truffle-parmesan frites, balsamic-glazed summer squash, and topped with herb butter. A bottle of housemade IPA steak sauce came on the side but I didn’t touch it because I’m not a fan of steak sauce. I asked for the steak to be done medium-rare and that was what I got. It was tender and moist but lacked beef flavor (ever since my visit to John Howie Steak – review to come soon – the bar for steak has been set!). I guess I came into this with higher expectations due to the recommendation, so I’ll have to say, I was slightly disappointed. 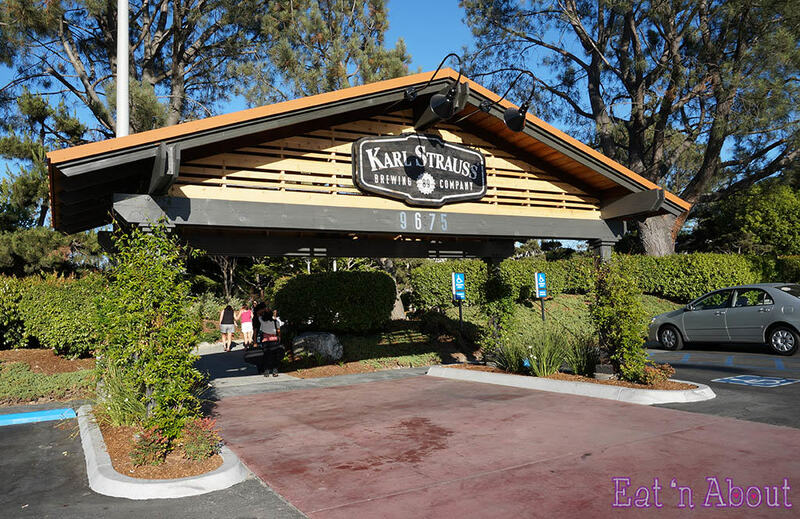 My final say for Karl Strauss would be, it’s definitely a fun place to come hang with friends either after work or on a weekend. I know I’ve only tried two menu items but I think this would be a place more for their beer and the atmosphere than for the food, although the Happy Hour pricing definitely helps. Next PostBob Likes Thai Food – Main St.